Timothy O’Donnell during his night on June, 19th [ 16 vs 100+ Enemy] OP4 FOB TILLMAN, Lwara Afghanistan in a 2 – 3 + gun fight. 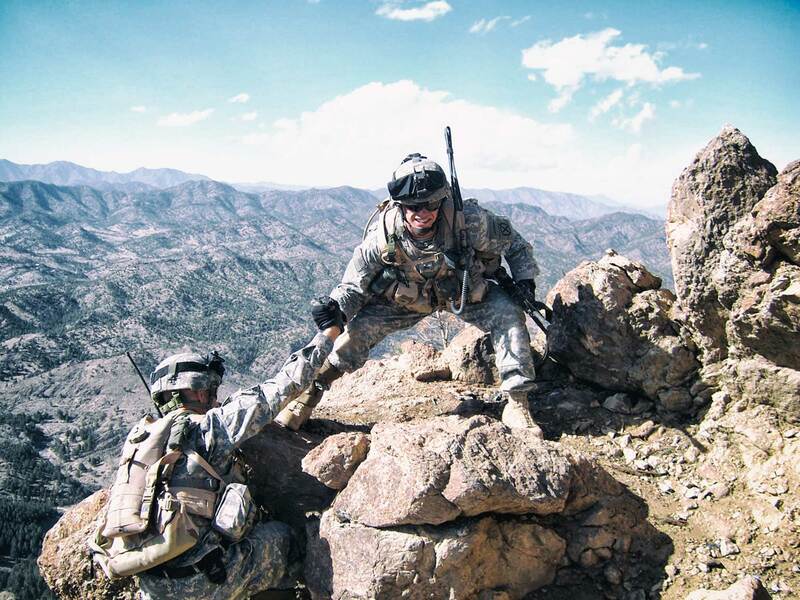 When nearly 100 enemy attackers paid a visit to Army 1st Lt. Ryan Case, the leader of 3rd Platoon, A Company, 2nd Battalion, 87th Infantry Regiment, Task Force Spartan, he greeted the unwelcome guests like a Catamount. 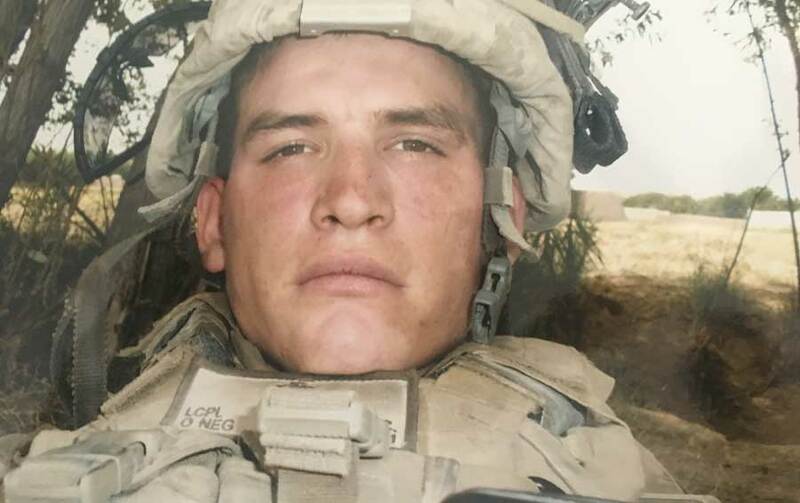 Rocket-propelled grenade, machine gun and small arms fire greeted Case and his platoon of Catamount infantrymen during the dead of night as the Washington, Mass., native turned 25 years old on the Pakistani border. As the sun set over the mountains and hills along the Afghan-Pakistani border, the platoon settled in for a “normal” night as measured by the standards of tumultuous Paktika Province. Case and his Soldiers said thought the night would feature the usual variety of watches, reports and radio transmissions. It may, perhaps, be punctuated by an occasional burst of small arms fire from near- by Afghan National Army positions, they said. Artillerymen, firing from FOB Tillman, dispatched regular 105 mm messages to insurgents, the substance of which suggested insurgents infiltrating through the borderlands, encouraging them to reconsider their plans. But this night was different. Case said his radio transmitter-operator woke him during the dead of night to inform him of heavy fire directed at the observation point. 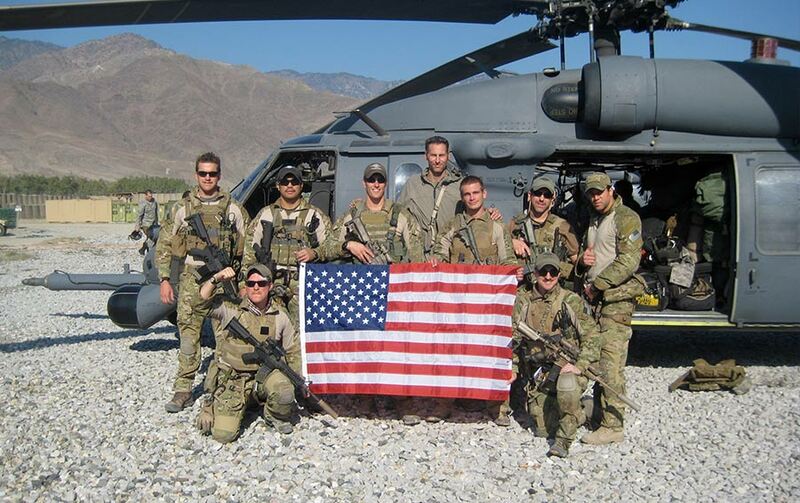 The platoon leader radioed Army Capt. Chris Nunn, then the A Company commander, informing him of the contact. Case told Nunn he planned to climb from the small supply outpost at the base of the position to the top of the OP in order to personally survey the situation. At the summit, Army Pfc. Joshua Montgomery, a rifleman from Saratoga, N.Y., prepared to relinquish his guard post to Army Spc. Jeremy Greene. A flurry of explosions, tracer rounds and small arms fire abruptly ended Montgomery’s conversation with his relief. “You could hear the explosions, and you could just see the tracer rounds coming from everywhere,” he recalled. “That’s when you knew it was on. It was no joke.” Montgomery and his fellow Catamounts scrambled to their fighting positions, immediately eyeing the ridge lying just east of the OP. Dodging small arms fire along the way, meanwhile, Case and his RTO ascended the steep terrain, a challenging proposition even amid peaceful circumstances in day- light. 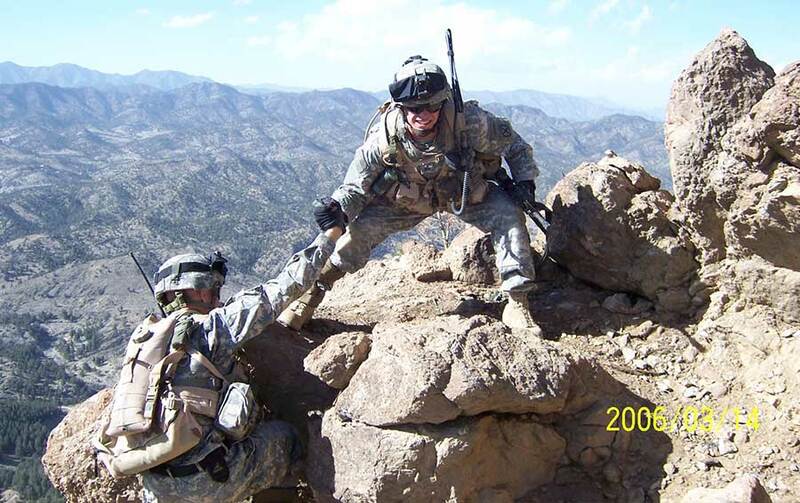 Bedlam greeted the platoon leader and his RTO as they reached the 7,100- foot crest. The platoon leader rushed to the west bunker and directed the defense of the OP amid explosions and the ricochet of AK-47 rounds. By the time he reached the position, Case recalled, the enemy “was within 20 meters of the bunker.” The Catamounts returned enemy fire from fighting positions and strategically located bunkers. “We were all down in our bunkers,” said Army Spec. Pedro Quezada, a New York City native who served as the platoon forward observer. As the battle raged, the infantrymen heard the strained voices of enemy fighters attempting to breach the OP’s defenses. “It was probably the scariest time of my life,” Case recalled. “At one point we stopped firing for like 15 seconds to save ammo and to try to determine where the enemies were,” Quezada added. “We could hear them screaming and yelling to each other. At that point, (Staff Sgt. Christopher) Matt started firing off the Claymores.” Montgomery “was standing up and firing at them. He was like a (very) crazy man.” Unsure of the precise numbers and proximity of the terrorist attackers as the voices grew increasingly louder, the Catamounts resorted to emergency measures. “It sounded like the voices were getting close,” Quezada said. “So we started throwing cots outside the bunker. We piled them outside the door.” When Army Staff Sgt. Gary White “tried to get in,” Quezada continued, the cots obstructed his path. “He was yelling ‘Friendly! Friendly!’ Finally, he jumped over the cots and got in.” The Catamounts and insurgents dueled with rifles, machine guns and fragmenta- tion grenades, with Matt expertly lobbying the American salvos. Although heavily outnumbered, the 3rd Platoon infantrymen held off insurgent attackers during repeated and furious attempts to overrun the position. The militants paid a high price for the limited breach of the security cordon they achieved. Blood, clothing, ammunition and effects remained on the slopes the next morning, confirming the bloody defeat the militants sustained despite insurgent attempts to obscure their loss- es by evacuating dead bodies from the area. Amid the chaos of shells, explosions, shouts and screams, Case and Quezada radioed the FOB Tillman tacti- cal operations center to outline the array of friendly and enemy forces and the situation. TOC fire supporters, in turn, relayed instructions to brother 3rd Brigade Combat Team Spartans from 4th Battalion, 25th Field Artillery Regiment. The artillerymen delivered a deadly barrage of 105 mm high explosive and illumination rounds, helping to turn the tide of the battle. “Once we got on them, the fire was effective,” Case recalled. “When we started to hit their support-by-fire posi- tions, they started to turn around and head back toward the border. We started to feel it was going in our direction.” The artillery shells, grenades, Claymores and withering small arms fire finally convinced the militants of their failure. After enduring ferocious Catamount bursts and blasts as well as deadly 4- 25 artillery fire, “they realized they weren’t going to take the OP,” Case recalled. The enemy RPG, machine gun and small arms fire diminished and then ceased. The frenzied voices yelling instructions in Pashtun fell silent. The enemy retreated along a wadi and through the mountain passes, the terrorists burdened by the weight of militant corpses they carried with them to conceal their losses. The Catamounts, joined by Afghan National Army Soldiers from 4-1 Kandak, 203rd ANA Corps manning an adjacent position, engaged the fleeing enemy until the insurgents disappeared beyond the mountains. Coalition Soldiers dis- patched at least 30 insurgents, and perhaps as many as 50, during the two-hour battle. Virtually all of the Catamount Soldiers defending the OP sustained superficial injuries caused by RPG explosions and small arms fire. Miraculously, no U.S. Soldiers died during the bloody battle. The assault on their OP surprised some of the Catamount defenders.